Running for a charity isn't the easiest of challenges and especially when you have to train for the event in the winter. The evenings and early mornings are now getting darker and colder, so it can be hard to keep up with your training schedule as the comfort of your warm bed or a night on the couch beckons. We've got some great tips to help you stick to your training schedule through the coldest months, whether it be finding a bit of extra motivation or getting the right kit to face the elements. Braving the cold can be one of the biggest obstacles to getting out there during the winter, so make sure you wrap up well. Try not to get too hot as excessive sweating will give you an instant chill. Invest in some thermal running leggings, and long sleeved layers which will keep the cold out so you can work out at your best. It's also worth getting a lightweight waterproof for running in case you get caught in a shower. You can always take a layer off once you are warmed up. It's also worth trying a thin neck warmer which you can pull over your mouth to take the edge off the biting cold air you are breathing in. Warming up becomes even more important to protect your large muscles against injury. Running on the roads after dark can obviously be dangerous as you are far less visible to passing vehicles and cycles. Think about getting a high visibility outer layer or look out for running gear with reflective stripes to help you show up in the dark. Be extra careful when crossing roads or intersections: as you will be moving quickly cars will be less likely to spot you. Look out for black ice on pavements and roads during the winter. There are some great non slip trainers out there, and even some devices you can fit over your existing trainers to help you grip during frosty conditions, like 'Petzel spiky plus'. 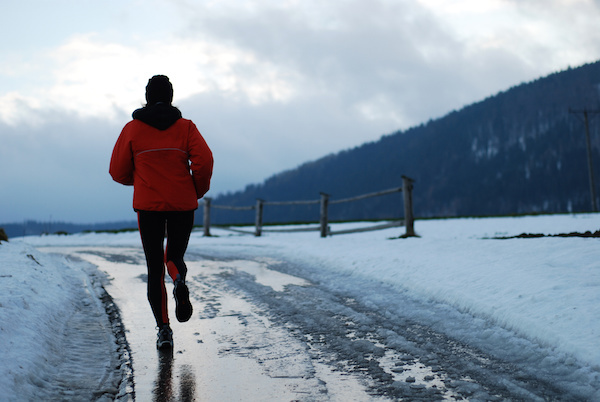 If conditions are too dangerous to run outside, head for the treadmill. You'll need to run for slightly longer for the same effect as you would see outdoors, but set the incline up and you'll be well on the way. Skipping with a rope is another indoor high impact activity to keep your fitness levels up when the weather is too bad to get outdoors. A slip on an icy pavement could lead to a serious injury which could set you back months. We all have one and it's important to play it as soon as you wake up or have it on standby when you feel like giving up half way through a training run. Motivation is so important, especially when you have decided to run for charity. Think about the charity and cause that you are fundraising for, every penny raised really does make a huge difference!